NETWORK UPDATE: The season finale of THE AMAZING RACE gained an extra 0.1 in final numbers, but the already-canceled THE MESSENGERS fell 0.1 to a tiny 0.2. CABLE HIGHLIGHTS: ESPN’s NBA PLAYOFFS doubleheader ruled the night at 1.99/1.20. Discovery’s BERING SEA GOLD was up a tick to 0.54, and UNEARTHED was down a tick to 0.31. On Adult Swim, CIHLDRENS HOSPITAL dropped 0.19 to 0.44, and the 4AM FISHCENTER was at 0.40. HANGAR 1 (History) lost a tenth to 0.24. 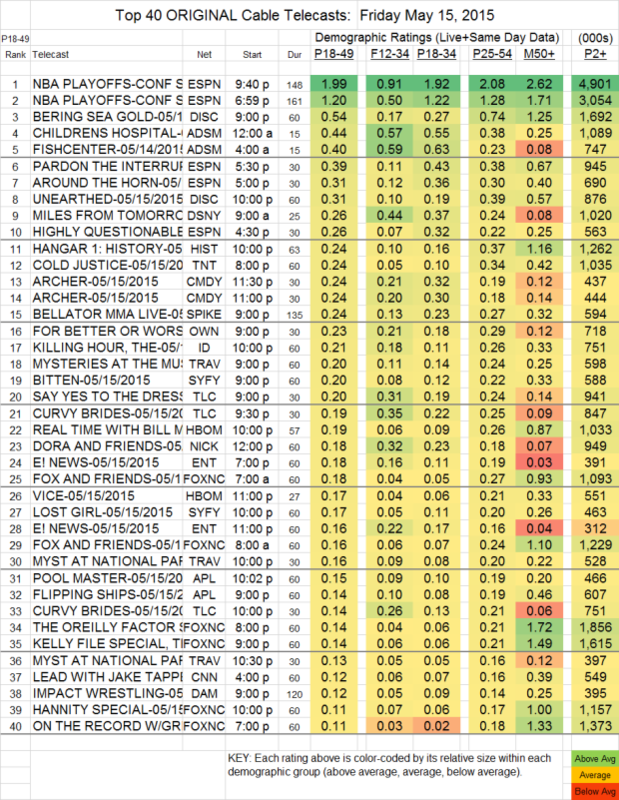 Also at 0.24 (down 0.03) was TNT’s COLD JUSTICE. FOR BETTER OR WORSE (OWN) gained 0.02 to 0.23. On Syfy, BITTEN rose 0.05 to 0.20, and LOST GIRL was also up 0.05 to 0.17. On HBO, REAL TIME WITH BILL MAHER fell 0.04 to 0.19, and VICE gained 0.02 to 0.17. BELLATOR MMA LIVE (Spike) was at 0.24. The 9PM IMPACT WRESTLING (DAM) rose 0.04 to 0.12 in 18-49s, was up around 10% in total viewers to 395K, and was almost exactly steady in households at 0.24/283K. The 11PM re-airing added 0.04 in 18-49s, 125K total viewers and 0.07/84K households. Among the micro-rated, COMEDY BANG BANG (IFC) was reported as holding at 0.01 in 18-49s, yet increasing hugely in total viewers from last week to 64,000–caution, however, should be taken with numbers at this level, since the Nielsen sample would be extremely small.